Introduction: Although uncommon, fulminant ulcerative colitis (UC) during pregnancy has been well described in the surgical literature. Laparoscopic approaches for many surgical emergencies during pregnancy have been shown to be equivalent to open procedures, with all the benefits of minimally invasive surgery. 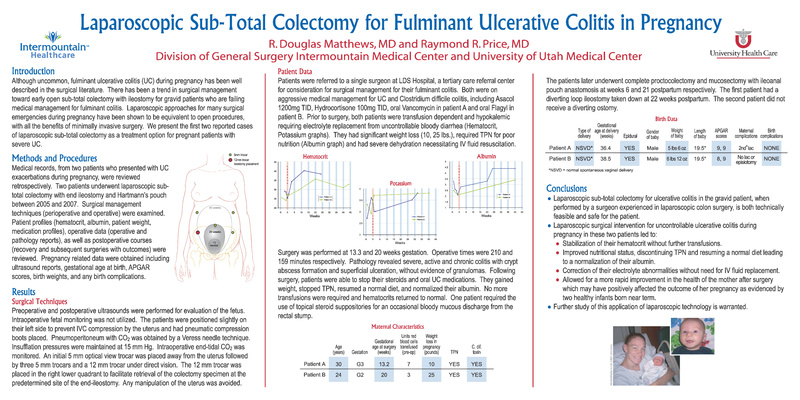 We present the first two reported cases of laparoscopic colectomy as a treatment option for pregnant patients with severe UC. Methods and Procedures: Medical records, from two patients who presented with UC exacerbations during pregnancy, were reviewed retrospectively. Both underwent laparoscopic colectomy with end ileostomy and Hartmann’s pouch between 2005 and 2007. Patient profiles (hematocrit, nutritional parameters, medication profiles), operative data (pathology reports), as well as postoperative courses were reviewed. Pregnancy related data were obtained including ultrasound reports, gestational age at birth, APGAR scores, birth weights, and any birth complications. Results: Prior to surgery both patients were transfusion dependent and hypokalemic requiring electrolyte replacement. They had significant weight loss (10, 25 lbs. ), required TPN for poor nutrition (albumin 2.1, 2.1), had dehydration necessitating IV fluid resuscitation, and were on aggressive medical management for both UC and C. difficile colitis. Surgery was performed at 13 and 20 weeks gestation. After surgery, the patients gained weight, had no transfusions, and were able to stop their steroids and oral UC medications. One patient required use of topical rectal suppositories. Patients delivered healthy infants at 38.5 and 36.4 weeks gestation (APGARS 8, 9 and 9, 9 respectively). Conclusions: Laparoscopic colectomy for ulcerative colitis in the gravid patient appears to be both technically feasible and safe for patient and fetus. Improved health of the mother after surgery may positively affect the outcome of her pregnancy. Further study of this application of laparoscopic technology is warranted.